Apathy for the Devil—A Bland Bio of Mick Jagger? 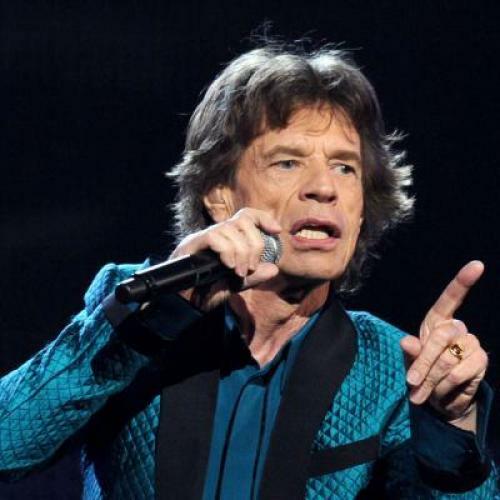 DID YOU CATCH Mick Jagger on Saturday Night Live’s season finale last spring? It was a bravura performance. Among other roles, he played a sad sack insurance rep at a karaoke bar, a campy queen on a Hollywood quiz show, and a slick-talking J.P. Morgan executive. He was impishly charming in his opening monologue, and when he performed several Stones classics he was as sprightly as ever. For a moment it looked as if the show’s final number, a sendoff for SNL veteran Kristen Wiig, might become too cloyingly sentimental; but when Jagger led the cast in a sing-a-long of “Ruby Tuesday,” it was genuinely moving. It may seem strange to think of Mick Jagger as someone whose talents have gone unfulfilled, but watching him perform that night it was hard not to wonder whether he might have had a successful acting career (instead of a sporadic and spotty one). And while it might be tough to envision a man who has fathered seven children with four women making it in politics, some have lamented that he never stood for Parliament. An iconic figure from the ’60s, he was for a long time uniquely poised to write the greatest and juiciest rock ’n’ roll memoir of all time, and in 1983 he signed a blockbuster contract with a British publisher to do just that. But he lost interest in the project (effectively ceding the task to his foil Keith Richards). Norman does not shy away from describing the controversy the Rolling Stones inspired. When the group first started up, the skinny young Brits aspired to nothing more than to perform blues covers (“tributes”) in front of small but adoring art school crowds. Their idols were Bo Diddley, Howlin’ Wolf, and Jimmy Reed. It was only after their wily manager Andrew Oldham came along that the Stones began styling themselves as the archetypal “bad boys” of rock, the anti-Beatles. They had a lot of success that way, but their new pose was an augury of the calamities to come. As objects of tabloid fury, and rough justice from the courts, for a while in the late ’60s and early ’70s, their very existence seemed precarious. If not for Jagger’s iron will, they surely would have split apart. Many biographies of Jagger and Stones are tawdry affairs, but Norman is too talented a writer to wallow in cheap sensationalism. Even as he engages the reader with wild tales illustrating the dramatic arcs and valleys of Jagger’s enviable life, he showcases Mick’s occasional kindness, generosity, and even his tendencies toward conformity. As a result, Mick Jagger has a bit of a seesaw quality: again and again, we are reminded that its subject was capable of behavior that was both roguish and redemptive. Stones fanatics may not be accustomed to this type of balanced portrayal, but ultimately Norman deserves credit for honoring his subject’s complexity. The guy who wrote “Sympathy for the Devil” is also a fitness nut and a doting father, and his hobbies include cooking and reading. There is one big caveat to Norman’s description of Mick as a nice-enough guy, and it involves the grubby way he has treated many of the women who have loved him. Mick’s first serious ex-girlfriend, Chrissie Shrimpton—presumably the inspiration behind some of the Stones’s most scathing and abusive put-down songs (“Under My Thumb,” “19th Nervous Breakdown,” “Stupid Girl”)—wound up attempting suicide. So too did his next inamorata, Marianne Faithfull. He cheated on Chrissie with Marianne, and he cheated on Marianne with Marsha Hunt. Later he dated Marsha properly, and he asked her to get pregnant. No doubt expecting a life of cozy domesticity, she went ahead and had his child, only to find that his mood had changed. Now he was denying paternity and he enlisted a lawyer to give her the runaround. (Years would pass before he finally acknowledged he was the father). After he linked up with the model Jerry Hall in 1977, Mick—at about age thirty-five—started keeping a lover who was just seventeen years old. Norman presents this as a great big scoop, but in fact the tale has been told before, and it continues to lack credibility. (His only evidence is a bit of hearsay from many years ago.) Anyone who knows COINTELPRO’s history would doubt whether its agents had the wherewithal to carry out such a complicated and far-seeing plan, and besides, in January 1967—when the plot to set the Stones up was supposedly hatched—the FBI had not yet turned its attention to the subversive influence of British rock stars. (That would happen later with John Lennon, and his was an unusual case.) Also, the Stones’s musical output at that point was devoid of any political inferences. It was only later that the group had its brief flirtation with New Left politics (and when they did, they had little trouble getting into the United States). As enjoyable as this book is, it is hard not to make a diminishing comparison between Mick Jagger and Norman’s previous effort, his magisterial 800-page John Lennon: The Life. Then again, when Norman was writing about Lennon, he had much richer material to mine. We see now that Lennon’s life had some of the characteristics of a Russian novel. An authentic genius, he was also a troubled man, stalked throughout his days by primal forces of abandonment and loss, and then finally struck down in a hail of assassin’s bullets. By contrast, this anodyne portrayal of Mick Jagger opens with a scene from the 2009 BAFTA (British Academy of Film and Television Arts) Awards, at which he presented the statuette for Best Film, and perhaps preened a bit for actress Angelina Jolie (who was in the audience, and whom he wooed assiduously in the late 1990s.) In the book’s penultimate scene, Mick performs a tribute to Solomon Burke at America’s 2011 Grammy Awards. In both instances, Mick was tad mischievous. He was charming. He was professional. He delivered exactly what a fan might expect, and nothing more. John McMillian is an assistant professor of history at Georgia State University. His book Beatles Vs. Stones: The History of a Legendary Rivalry (Simon & Schuster) is forthcoming in 2013.